The thing with Hearthstone is that unless you're at the top percent playing in actual events, it's a ladder based game. What that means is that your ability to play a large quantity of games matters more than your win chance on an individual basis. A deck you're able to win a little over half the time with is better than a deck that wins 70% of your games if the first deck completes said games twice as fast. Also, the longer a game goes, the more decisions players have and the larger the margin of human error. In a game like Hearthstone, there's also an RNG factor where the more of these effects are used, the more likely it is that one of them turns against you. In conclusion, if you want to start learning this, or any other card game for that matter, the first thing you should do is play aggro. Just beat face, plain and simple. The more basic your strategy, the harder it is to make mistakes. I'm a 100% free player, meaning I haven't even used in-game currency to pick up the campaigns, and have been playing off and on since the day it went live. It didn't take me long to figure out the flow of Warlock Zoo, and I've barely changed the list over the course of the game's existence. If you don't know, Zoo is a term from Magic, referring to an aggro deck that uses cheap value creatures from an assortment of different tribes, rather than focusing on a theme such as Murlocs or Mechs. These are cards that aren't printed to work well together. Each can stand on its own. 2x Voidwalker - Standard taunt minion, trumps 2/1s. By using the Voidwalker to beat their face in, you spend your turn accelerating toward a win while forcing the opponent to play defense and trade minions. Place next to Dire Wolf for best value. 2x Argent Squire - 1/1 with Divine Shield, which lets it trade a few hits before going down. Easy way to kill enemy x/1s and take board control, also Divine Shield is great with a way of giving it Taunt. 2x Flame Imp - A 3/2 for 1 is a really fast start for the play, able to take on Voidwalkers or Acolyte of Pain with no help from your other cards. With a Dire Wolf, Imp is able to trade with much more expensive threats and get you a lot of value. 1x Leper Gnome - Pretty much guaranteed two damage to the opponent. Abusive Sergeant would fill a similar role, but I use Gnome over him just because Gnome makes a better turn one drop. 2x Dire Wolf Alpha - Really solid card. The extra one damage lets you effectively play threats and removal at the same time, as your new minion allows your old ones to trade up (kill something more expensive than they were). The trick with this card is positioning and attack order, because you can suicide one minion getting buffed and the power bonus will then apply to the next in line. 2x Knife Juggler (Rare) - In my honest opinion, the best two drop minion in the game. The damage may be random, but damage is damage. More of it is never a bad thing. The 3/2 body makes him a good beater and the effect is just an extra bonus that can kill enemies in a pinch. Remember that if a certain target for Juggler would be wasted damage, you can always attack and kill that target before playing out your allies. Otherwise play allies before attacks, because knowledge is power. 2x Haunted Creeper - Instant army, lets you keep up the pressure after an opponent wipes your board. Also really good to get extra triggers off Juggler. 2x Nerubian Egg - There are a few reasons to use this card, aside from a post-wipe ally. Anything that grants a bonus to attack strength, like Dire Wolf Alpha, will let you suicide in with the egg and get yourself a 4/4 for 2. That's good value. 2x Harvest Golem - If you've noticed a theme, good. The deck is fast enough that after the first two or three turns of the game, if your opponent doesn't pack ways to sweep an army, you've probably already won. This is why you play specifically expecting them to. Harvest Golem is a double threat that, unlike the others, is a decent sized body the first time around and is a little harder for the opponent to just trade a small minion with. It forces out a sweeper and instantly helps you recover from said sweeper. 2x Defender of Argus (Rare) - Defender of Argus and his little bro Sunfury Protector are two great ways of giving cards Taunt that really shouldn't have Taunt, like your Nerubian Egg. I play Defender because he also makes the affected guys a little bigger, and that means more damage. Don't be afraid to play him next to guys that already have the keyword because it's better than next to no one at all. 2x Piloted Shredder - Best common in the game. There are a lot of large bodies for two mana, including a few with battlecry drawbacks that won't trigger, like Succubus. There are very few times when this card has died and I was unsatisfied with the result, though be wary of Explosive Sheep or Doomsayer. 2x Doomguard (Rare) - Massive burst of damage to win the game with. If you're pushing for it with lethal, make sure you play the cards in your hand you need to play first before dropping him. Ideally your hand is empty anyways. 1x Mortal Coil - This is kind of silly, but just a card I personally like. Knife Juggler has a lot of RNG ping, which makes the opponent get hopeful when they see the last point you needed miss. Then you play this card and make them sad. In aggro mirror, good use of the coin to recover from the fact you're going second. 2x Power Overwhelming - Large burst of damage, usefull for both winning the game and overcoming a massive Taunt creature that would otherwise ruin your day. Best when played on Nerubian Egg. 2x Darkbomb - Mostly used as removal or to clear a taunter off the board. It's always better to kill their dude and hit with a minion for 3 than trade minions. Can also go for lethal. 2x Imp-Losion (Rare) - Get Knife Juggler before crafting these. It shouldn't be hard to see why. Eight rares, but eleven cards you get for free, either from the first adventure or basic class cards. Start each game with aggressive mulligans so that you can see your curve. 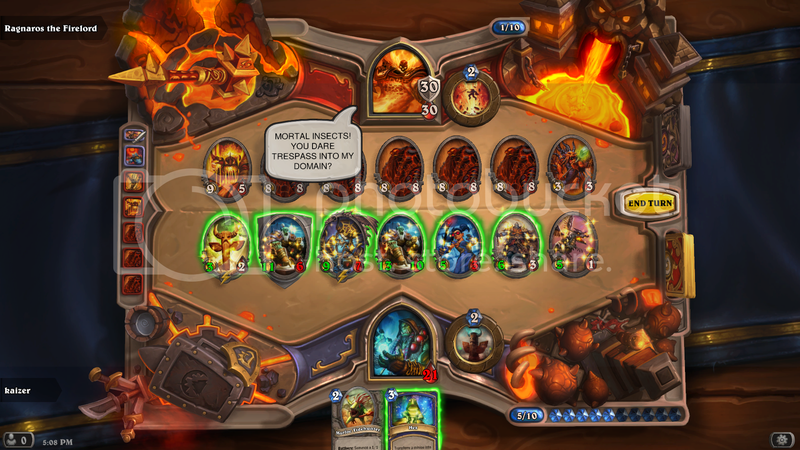 If you look at your hand and don't see turn one, two, three minions in it, there are cards you can shuffle. If you don't have a one drop, shuffle all of them. Your first priority early game is to wrest control of the board. If you decide what fights what, you have control over every trade and can swing the entire game in your favor. Once you have enough minions to hit the opponent for damage, start playing guys with deathrattle for longevity's sake. If you have other things to do with your mana, never use your hero power. If you are going to use it, always do it first (unless doomguarding), as knowing the new card you have available may change the plan you had. The rule of thumb for playing aggro is that you're going to have to do quick calculations in your head. The first step each turn, starting from turn four or so onward, is to add up the damage you have on board and figure out if the burst you have in hand is enough to kill. If you can't win the game that turn, figure out if there's a way you can secure victory the turn after. Often you might think hitting the opponent with everything is the fastest way to burst them down, but if you kill them in the same number of turns either way it's better to make sure you have the threats you need on board the next time your turn comes around, and one stray minion your opponent gets to keep is a Shadowflame waiting to happen. Figure out how fast your clock is (how many turns it takes to win), and how much excess damage you have after that clock ticks down. That extra damage is how much you can afford to spend on minions to get them out of the way and help your chances. Soulfire: Used to be great, now not so much, but if you have the slots open there are worse cards to play. Helps in a pinch or a push for lethal. You can also target your own minions with this card, whether to kill of Leper Gnome, trigger Deathrattle or get an extra Dire Wolf pump. Abusive Sergeant: Like Leper Gnome. Worse against taunt or by himself, but helps flip Nerubian Egg. Clockwork Gnome: There are only a few spare parts you actually want, but if you're still missing the better 1 drops and find your aggressive mulligans aren't enough to overcome the odds, this will do. Young Priestess: Rare, but you might open some. She's not great by herself, but if you get lucky and the opponent can't deal with her early he may find it tougher to clear your board of threats. Best when coined next to a Voidwalker. Ironbeak Owl: I go back and forth between playing this card or not. His size is bad for the cost, but he's really good at shutting off a taunt the turn you push for lethal, or neutralizing a Nerubian Egg before it flips. There are matchups where it's great and others where it's mostly useless, but he is a common. Mad Bomber: A horrible idea if you already have board presence, but if the enemy stabilized or you coin him in, this possibly inverted Flame Imp isn't a bad beater for his cost. Can also kill your own Nerubian Egg, if you're lucky. Ogre Brute: 4/4 for 4? Thank you. The RNG has a secret bonus in that it lets you attack the opponent through taunt, and he can also hit stealth if I remember correctly. Most of the time you won't ever have to take the risk because your opponent will spend their turn and probably multiple cards killing him, which is a good deal for three mana. Shattered Sun Cleric: Until you get Defender of Argus, this is as good a common substitute as you can get. Doesn't grant taunt, which is a huge downside, but does make a minion bigger, costs less, and is a 3/2 over 2/3. Dark Iron Dwarf: Like Abusive Sergeant, but on a 4/4 body. Until you have two copies of Doomguard, you probably want these (and maybe Ogre Brute) as much to have large bodies in your deck as for any other reason. Reckless Rocketeer: Another cheap Doomguard substitute. He's pricier and nowhere near as durable, but does just as much damage and can get in there for lethal. Also lacks the discard requirement. All this being said, there's a new expansion coming out tomorrow and though I haven't looked at most of it, there's probably something which will change this list. Take what I or anyone else says as suggestion, not concrete. Solid explanation of the zoolock deck. There are some fun variations of this deck, one being the Demon zoo deck that revolves around having a few more demons in your deck, or the Hobgoblin deck that adds a few more 1 attack minions that can be buffed by it. 'cept Hobgoblin requires you to actually own hobgoblins. We're mostly just talking low budget, here. It's true, though. There's a lot of ways to build it, a lot of options. You guys would be no match for my blue deck though. It's got three Mewtwos and three Kangaskhans in it. Not to mention a bunch of Lickitungs. Do not get me started on Professor Oaks. 6 bosses down, 11 to go! 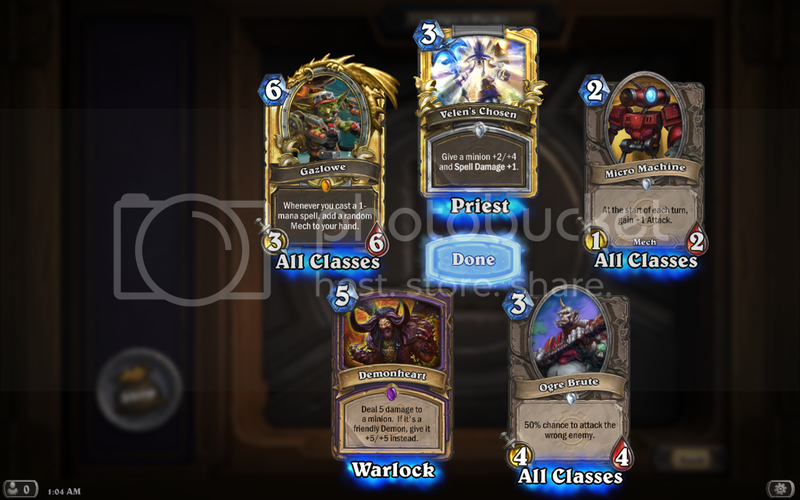 Not the worst pack I've ever opened. Turned it into Doc Boom, because everything can play Doc Boom. Gazlowe is cool and all I guess, but it wasn't the reason I was opening GvG. Hopefully they announce a good expansion or adventure today. TGT was pretty disappointing. I hope they bring in some meta changing cards.